The hats, caps and helmets are a unique set of armor that provides users with an improvement in one of the following areas: defense, critical chance or speed. They were once some social items that provide no in-game improvements. The hat you choose depends on the game mode you play. If you're on single player campaign, you may use the Sergeant Helmet. If you play coop multiplayer, you should have the War Marshall Cap on because taking hit in coop is no good for the team multiplier. Unless you don't care about score, you should have a set of armor that lets you run faster to avoid hits. Of course if you just want to survive than stick with your Sergeant Helmet. 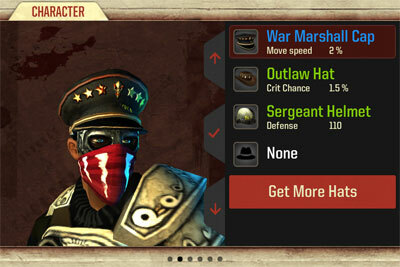 ok, I'm about to buy the war marshall cap but I doubt of it's capacities. I currently have the sergeant helmet with 110+ defense. Will using the cap reduce my overall defense? will i be weaker?